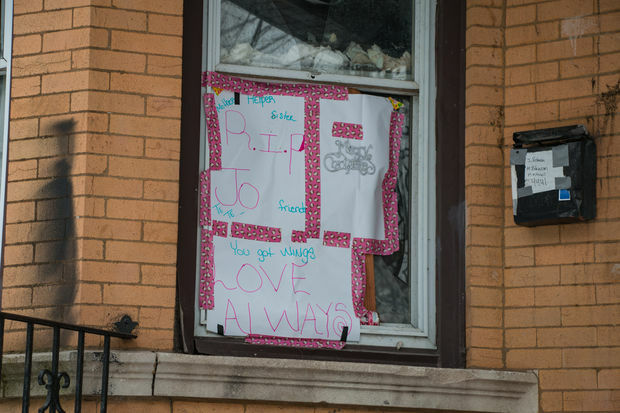 A window on house in the 4400 block of West Monroe Street served as a memorial to someone slain in a shooting. GARFIELD PARK — The 4400 block of West Monroe on Chicago's West Side is a residential street of two-story buildings, senior citizens and a day care center. It's also the city's most dangerous block of 2016, a stretch plagued by heroin, shootings and murder. "I don't think it's safe here any time," said a landlord on the block, who asked that his name be withheld out of fear for this safety. "I think this is one of the most dangerous blocks" in the world, the landlord said. Just west of Kostner Avenue, the block was the site of eight separate shootings this year in which someone was wounded. One of those shootings killed 30-year-old Demarco Richards, who lived on the block. Ten other people were wounded in the gunfire. Shootings have spiked across Chicago this year. The number of shootings and the number of people shot this year both rose by about 47 percent compared to a year ago, according to data compiled by DNAinfo. The spikes have affected neighborhoods across Chicago, but West Side neighborhoods like Garfield Park and Austin and stretches like the 4400 block of West Monroe — where there were just three shootings in 2015 — have been the hardest hit. It's because of drugs, authorities say. While the South Side spike in shootings is because of "disrespecting on social media," on the West Side there is a "generational drug problem," Chicago Police Supt. Eddie Johnson said. "It's more about drug turf." Citywide, the number of drug arrests are down by about half from the 24,000 arrests made last year. Most of the drop came in West Side neighborhoods. Johnson said the change is due to a policy focusing on "drug diversion" programs that find alternatives to arrests. Police are instead directly focusing on gun violence, seizing more than 8,200 guns this year. Coupled with the hiring of 970 officers, Johnson is hopeful the new approach to policing will curb violence next year. Ald. Jason Ervin, whose 28th Ward covers Garfield Park, said those involved with drugs shouldn't get a pass from the criminal justice system. "Where you find drugs, you are going to find violence," Ervin said. "There has been a laxer attitude of possession and delivery of narcotics. It has emboldened the climbing violence." Ervin and Johnson said they hope the new officers — and the creation of 350 new detective posts — will help curb the violence next year. In the meantime, those who live and spend their time in Garfield Park and on the 4400 block of West Monroe Street struggle with the area's violent reputation. "There are good people who live in East and West Garfield Park," Ervin said. "This issue does not define us. There are good people who live there. With some help, our community can flourish like other communities in Chicago." During a visit to Monroe Street this month, some homes had holiday decorations: snowmen in the windows, "Merry Christmas" signs facing the street. Rainbow day care, where a woman held a child on her hip and smiled but said she was too busy to talk, had its door wrapped in green and red like a present. In one window, where the glass was partially broken, was a series of signs held together with Hello Kitty tape. "Mother, helper, sister," the signs read. "RIP." A small, silver sign that said "Merry Christmas" had been taped up, too. 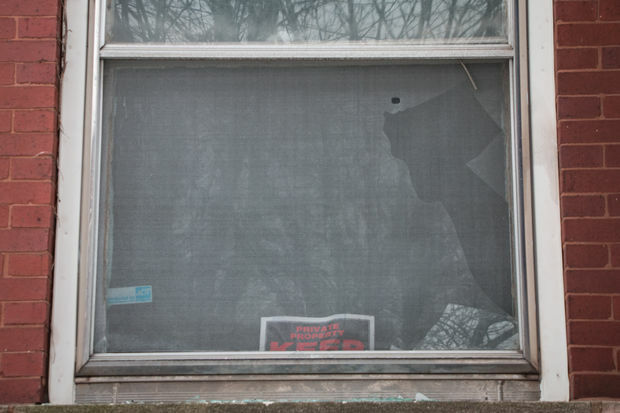 A few homes down from the day care, a worker pointed to a front window where broken glass lay on the sill and a round hole pierced a mesh screen. Bullet hole, he said. He was gutting the house. Farther down the street, the landlord sat in his truck and watched as maintenance men worked outside his building. He only comes to the area if he has someone with him, he said, and he always has a gun. "You should never come around here alone," he said. He gestured to the sidewalk and said there had been at least six shootings since August in front of the building. He's never seen anyone get shot, he said, but he's been around when there's gunfire. "In the building, hearing 'pop, pop, pop, pop,'" he said. "I guess this guy just got shot in the leg the other day," he said, pointing to a neighbor's home. None of his tenants has been shot. His three units are full despite the crime, he said, and many seniors live on the block. "I come here, I take care of my business, and I leave," he said. "We just come here for repairs, mainly, and to check on the building. And that's it. ... And we clean up here a couple times a week. "We just try to keep it clean. We run a very respectable business, try to help everybody out."